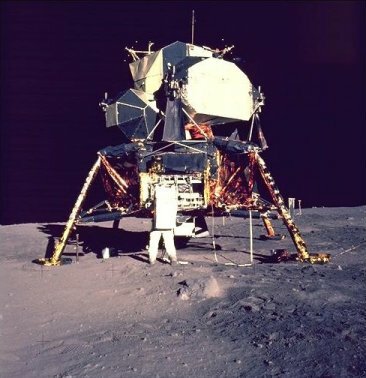 Apollo XI instruments still providing data...read JPL news release. 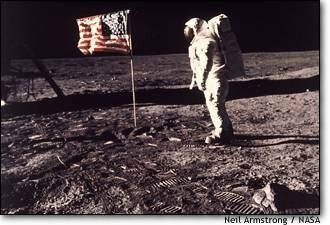 This country celebrates the 30th anniversary of Apollo XI  Neil Armstrong's and Buzz Aldrin's trip to the moon in July, 1999. Papers housed in the National Archives indicate that the White House and NASA made behind-the-scenes plans for tragedy: what to do if the Apollo XI astronauts were stranded on the moon. They even invented a less-offensive phrase for the plan. The stranded pair of astronauts would "close down communications" with Mission Control in Houston and be left in silence, either to die slowly or to commit suicide. "In Event of Moon Disaster" is the name of the document. It contains the steps President Nixon would take if the lunar module couldn't successfully leave the surface of the moon. After all, the U.S. had never tried this type of maneuver  it was all theoretical. Nixon talks to the astronauts - live on TV. If the astronauts were deemed to be doomed, the President was to call the "widows-to-be" to express his condolences. He was then to deliver a speech to the nation. At some point, communications would be cut to the moon, and a clergyman was to commend the astronaut's souls to "the deepest of the deep"  in the manner of a burial at sea. On June 13 , Frank Borman  an astronaut the president liked and whom NASA had assigned to be our liaison  called me to say, "You want to be thinking of some alternative posture for the president in the event of mishaps on Apollo XI." When I didn't react promptly, Borman moved off the formal language  "like what to do for the widows." Neil Armstrong and Edwin "Buzz" Aldrin, of course, made it safely back into the command module piloted by Michael Collins, and came home. "In Event of Moon Disaster" plan was tossed into a file and was never implemented. Buzz Aldrin is now 69, and president of Starcraft Enterprises (and two other companies in Los Angeles), and promotes space tourism. Neil Armstrong is now 68, and a businessman in Lebanon, Ohio. Michael Collins, 68, lives in Marco Island, Fla., and enjoys his time fishing. Christopher Kraft was the Director of flight ops for the Manned Spacecraft Center. He is now 75, still living in Houston, and is writing a book. Deke Slayton (Director of flight crew operations), one of the seven Mercury astronauts, died in 1993 at age 69. Wernher von Braun died in 1977 at age 65. The Los Angeles Times, Associated Press, Reuters, and CNN contributed to this report. William Safire, now with the New York Times, was not taking calls on June 9, 1999.